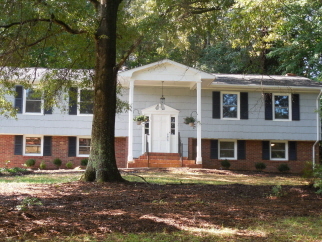 4 BR home with 1400+ HSF in great location! This 4 bedroom, 2.5 bath home is ready to move-in! New in 2018: heat & air, roof, replacement windows, new counters, new floors, cabinets, vanities & stainless appliances. No carpet here! All rooms are laminate or tile. Granite counters in kitchen, master bath & half bath. Full den downstairs with brick fireplace & built-in cabinets. Screened porch & separate deck. Large yard, privacy on rear. Home has central vacuum.